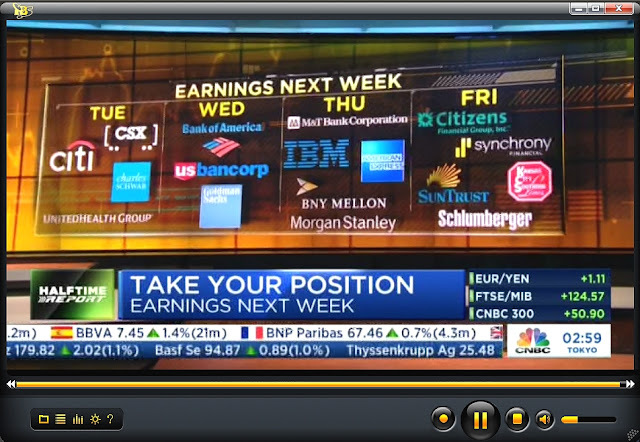 It was a very bullish week for US equity indexes, with net weekly gains ranging from 4.2% (Trans), 2.0% (Dow, R2K), 1.7% (Nasdaq comp'), 1.6% (sp'500), to 1.5% (NYSE comp'). Near term outlook threatens brief cooling, but broadly, first big target is the sp'2950/3047 zone, where the market will likely get stuck within 4-6mths. A second consecutive week higher for the sp'500, +43pts (1.6%), with a new historic high of 2787. Underlying MACD (blue bar histogram) cycle continues to tick upward, and stands at the highest level since April 2015. 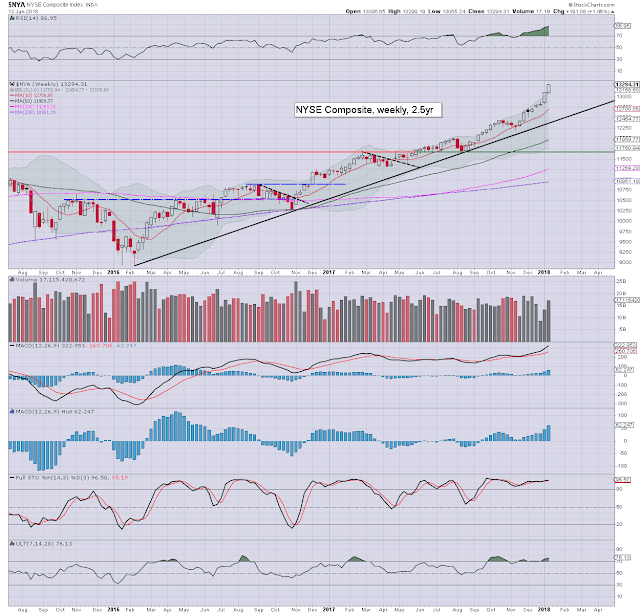 Weekly RSI is 87, which is the highest level since at least 1980. Best guess: there is s/t threat of a sporadic cooling wave, but probably no lower than the 2730s. More broadly, 2950/3047 is due late spring/early summer. The market will very likely get stuck, and see some degree of correction, at least on the order of 5%. The year end target of 3245 is on track. Equity bears have nothing to tout unless a bearish monthly close. For me, that would equate to a monthly close under the monthly 10MA, which currently stands at 2536, and is rising by around 40pts per month. So, from June 1st onward, that 'line in the sand' will be around 2730s. 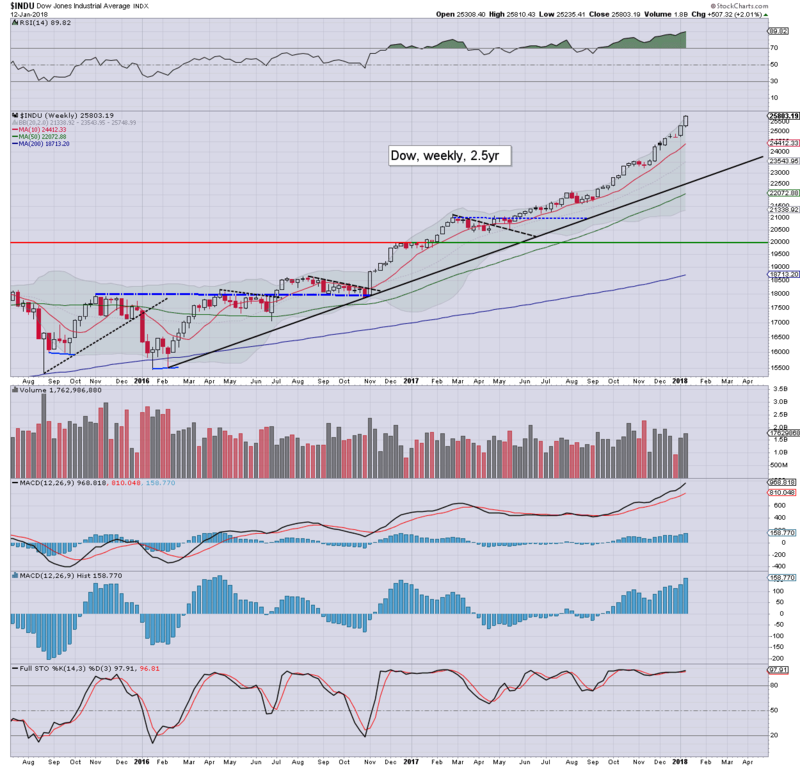 The tech settled net higher for the week by 1.7%, with a new historic high of 7265. Soft rising trend from summer 2016 is around the 6700s, and looks comfortably intact into the late spring.The 8000s are clearly on the menu by mid 2018, with 9000s by year end, assuming no main market correction much above 5%. 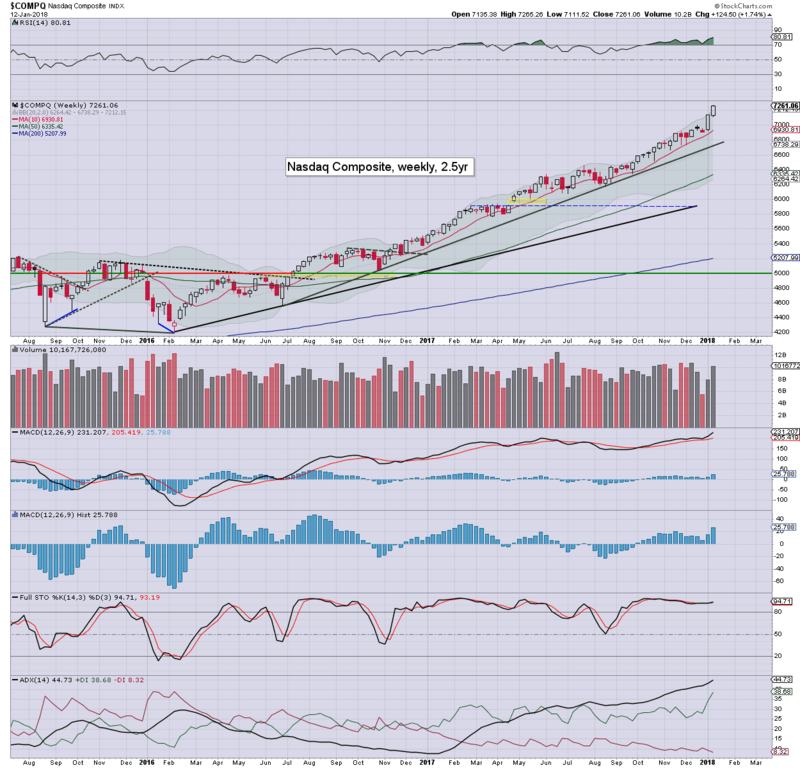 The mighty Dow climbed 507pts (2.0%) to 25803, with a new historic high of 25810. The 26000s are viable within the immediate term. Keep in mind the next big Fibonacci level of 26702. 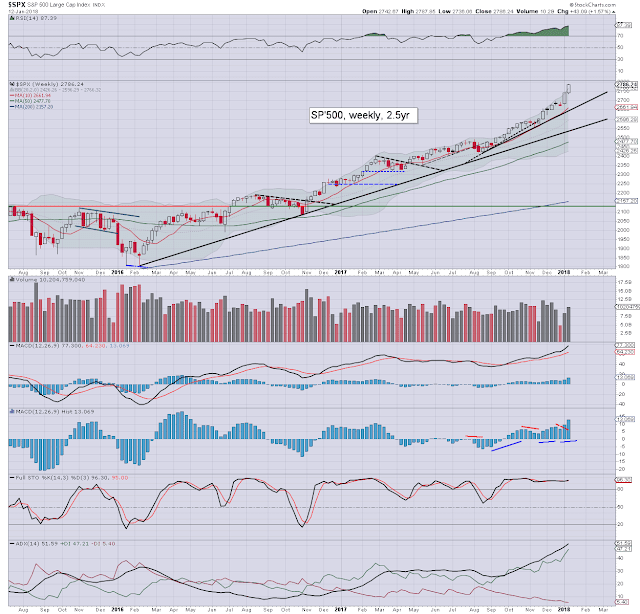 Any price action >26800s would indirectly give confidence that the sp'500 will eventually break >3100s (to be decisive). 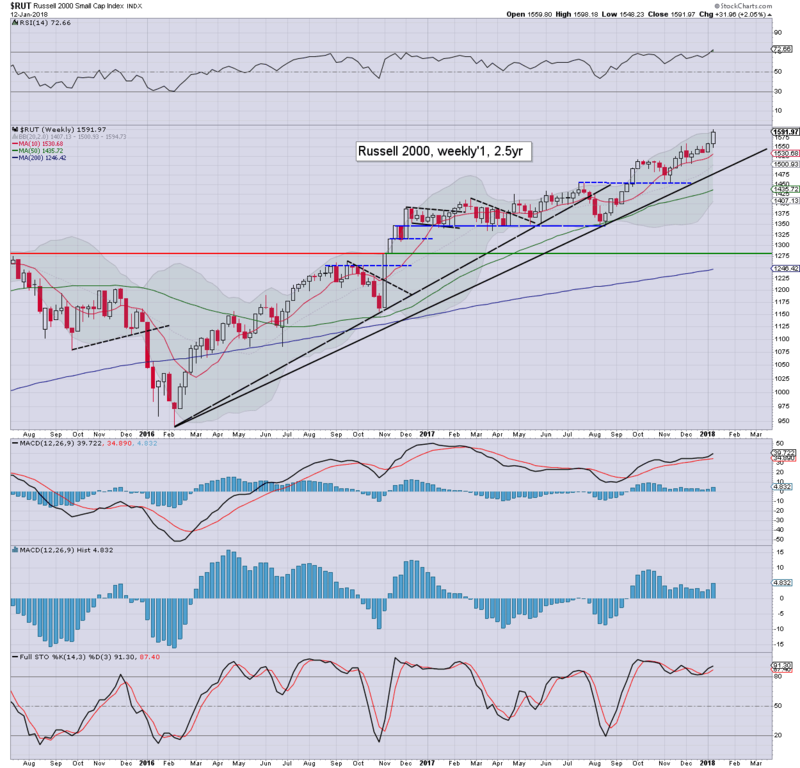 The latter would then offer next big target of 3900/4000 in 2019, with Dow 34/35k. I recognise those numbers will sound crazy, but then so did sp'2683 in Jan'2017. The master index climbed for an EIGHTH consecutive week, the best run since 2010, settling +1.5%, with a new historic high of 13299. 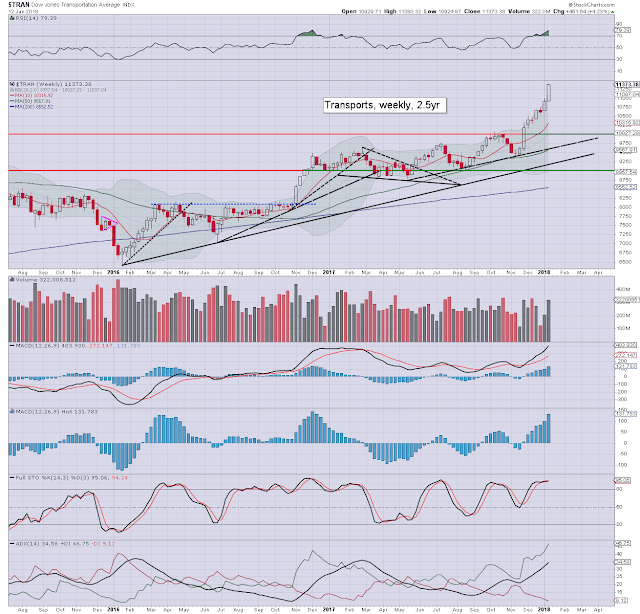 The 14000s are clearly viable by late spring/early summer, with 15/16k valid for year end. The second market leader gained 2.0%, with a new historic high of 1598. The 1600s are clearly imminent, with the 1700s viable by late spring. The 'R2K @ 2k' is something I've been teasing for the last few years. It won't be easy to reach by year end, but its 'just about' possible. 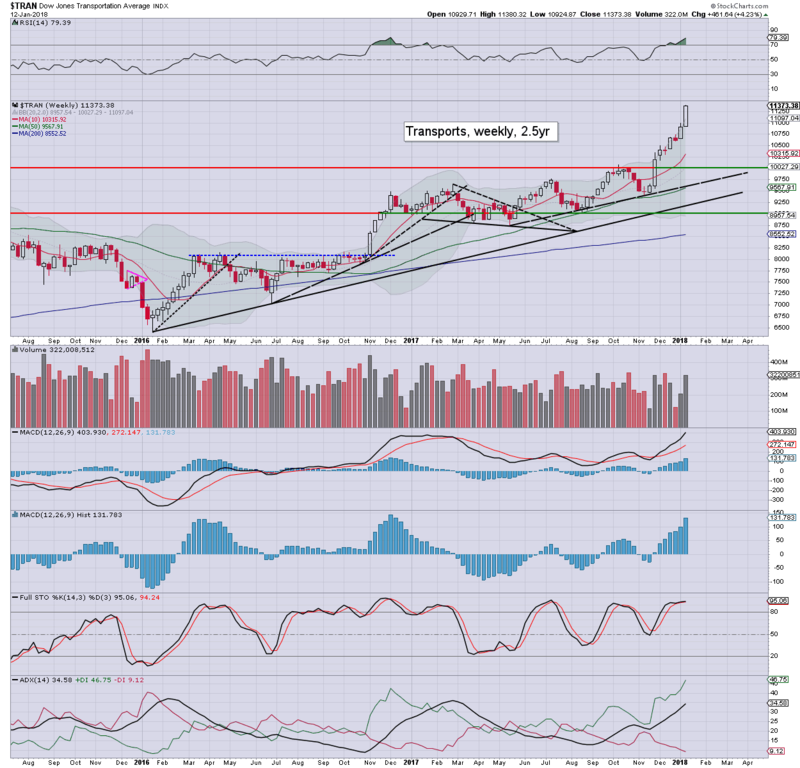 The 'old leader' - Transports, is leading the way higher, seeing a powerful net weekly gain of 4.2%, with a new historic high of 11380. 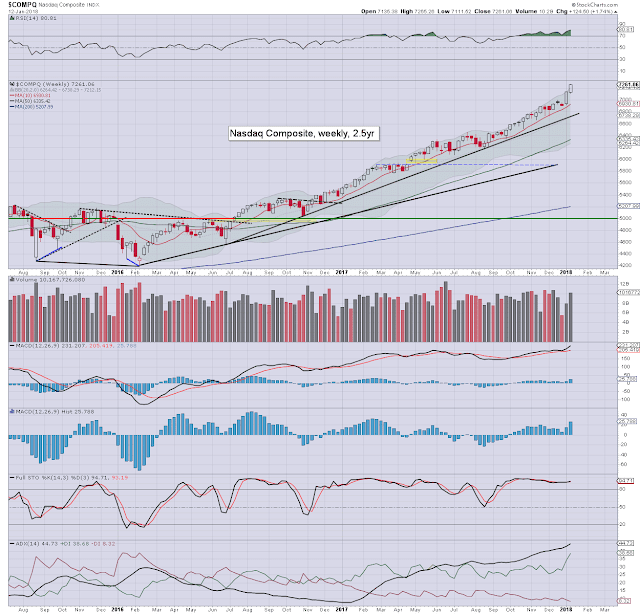 The 12000s are clearly on the menu this spring, with the 13000s seemingly probable for year end. It is notable that sustainably higher energy prices will be a downward pressure on transportation stocks, although that certainly doesn't mean they will be trading net lower in the months ahead. 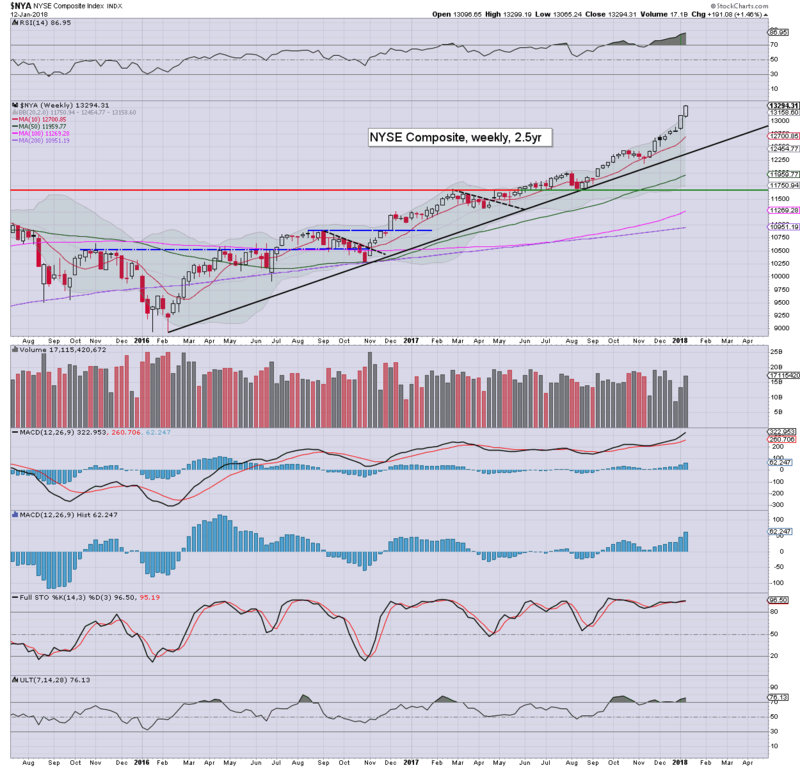 A very bullish week, with all six of the main US indexes breaking new historic highs. The Transports is leading the way higher, despite rising energy prices. Most indexes have around 4-5% of downside buffer, before first key support would be challenged. 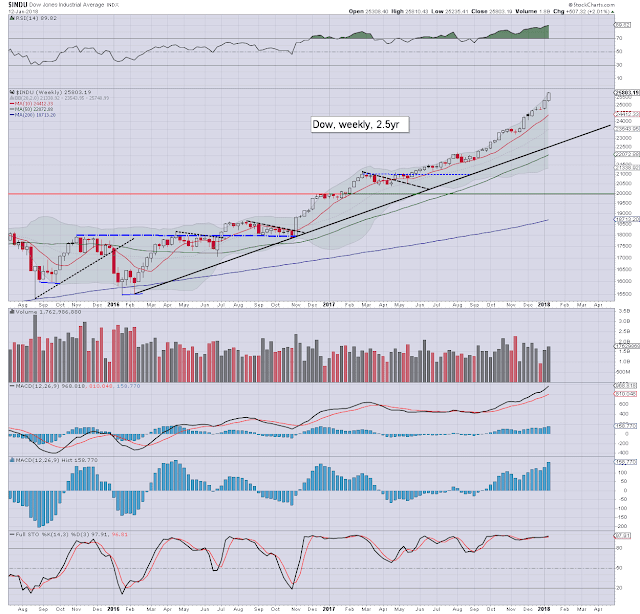 Equity bears have nothing to tout unless the majority of indexes see a monthly close under their respective monthly 10MAs, and that looks out of range until at least July/August. *there are three fed officials due on Wed', but none are likely to be of any importance.